Our Small Engine Oil Changing System vacuums oil out through the dipstick tube of your lawn mower—no need to tip mower to change the oil. 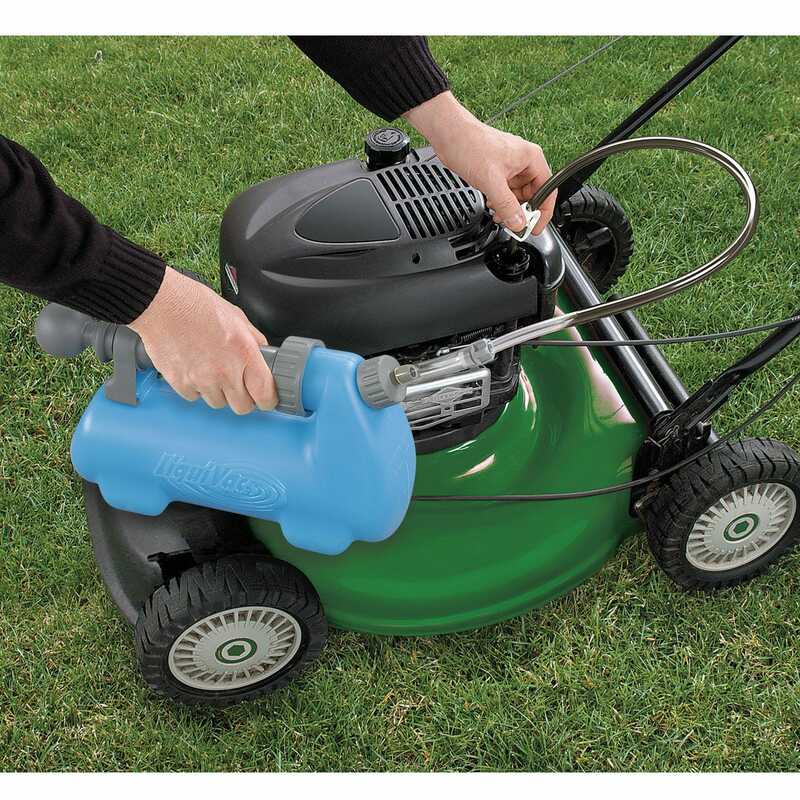 The hand pump creates a powerful vacuum through the 4’ suction hose to empty the oil from your mower into the 3 qt. recovery tank for disposal. Extracts oil in seconds—no electricity needed. Also convenient for changing oil in lawn tractors, motorcycles, ATV’s, leaf blowers, etc. Made in the USA. What I dislike about it is that it was very hard to get it to draw a vacuum. After following the instructions about adding oil to the small hole to moisten the gasket and let it soak for 12 - 24 hours, it still wouldn't work. So I added more oil and let it set longer. Finally, by tightening the parts together, very tightly, by hand. It will draw a vacuum but I haven't used it yet. At first there was no suction at all, but after applying some oil to the internals, as recommended in the instructions, suction was obtained by using the pump - however no vacuum was ever achieved, so the oil could only be removed by constant pumping action. This product can function, but does not perform as advertised. after reading the instructions, I decided to change the oil in my push mower. I found that it will only draw up the oil if I continue to pump the oil changer. I was under the impression that once I pumped the pump 20 times or so it would do it automatically. Never the less it worked the way I used it but at $60.00 it's a hard pill to swallow. Have not used the vacuum tank for its intended purpose, but have tested it several times -- excellent results. Can't wait for spring, to put it to use. Thanks for the review, Raymond! Lawn Mowers, tillers, and other small engine equipment are hard to drain if they don't have a drain plug, this vacuum pump makes it easy. Feel free to send us photo's of how you're using your new Pump! Thanks again! Where was this forty years ago? I just used the small engine oil changing system on my 1992 Bolens hand mower/mulcher and it worked to perfection. It is so much easier than hauling out my heavy auto ramps and balancing the machine on them and then reaching underneath with an allen wrench to unscrew the oil plug knowing full well that my hand is going to get drenched in oil (hey, you get used to it). Then there is the 30-45 minute wait while the oil drains into a pan, etc. etc. Messy, messy, messy. With the small engine system I didn't get my hands dirty, and the system actually works. Next I will try it on my John Deere tractor when the oil is ready to be changed. Yes I would definitely recommend this product. The heavy duty plastic seems rugged enough to hold up for a long time. The only thing I would like to know is how much oil the collection tank will hold. I have the smaller size. If it will hold all the oil in my John Deere I will be truly satisfied..
Have used the small engine oil changing system only one time to change the oil in my lawn mower. Simple and easy to use and wish I had purchased it a year earlier - my oil really needed to be changed. If the durability & reliability part holds up I will be exceedingly happy with my purchase, but I cannot rate that part at the present time. I followed the instructions, and the pump worked as advertised. The system saved me from a lot of mess and oil disposal problems. Followed the directions to a tee and never got the flow as advertised. Had to pump everything out and still had to put the mower on its side to empty. Best thing since shirt pockets! I have to admit, I was skeptical of it working. I was wrong. First time I used it, ended up changing my and two neighbors mowers!